Lyndon Johnson died January 22, 1973. Steven Brown was born December 27, 1950. Curiously she did not mention that Johnson was Steven’s father. 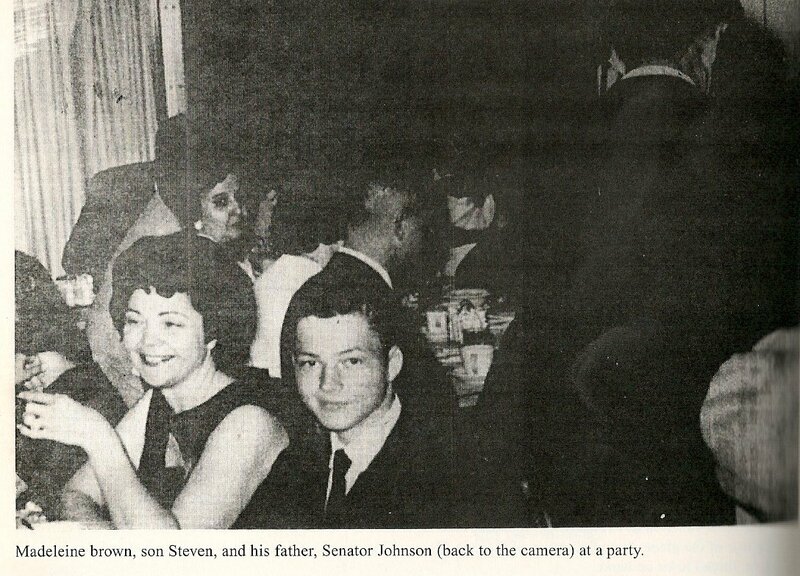 Brown claimed she met Johnson at the Driskill for “almost 20 years” which would be between 1949 and 1969 starting when she was 24 and Johnson 41. This would include Johnson’s years as president from 1963 to 1969. She stated the affair ended after she was involved in a traffic accident. Fourteen years and six months after Johnson’s death and thirty-seven years after his birth Steven Mark Brown sued Lady Bird Johnson. “A man claiming to be the illegitimate son of former president Lyndon Baines Johnson on Thursday filed suit in Dallas against Lady Bird Johnson for 10.5 million, alleging that she conspired to deny him part of the Johnson inheritance.” “In her affidavit, Madeleine Brown said (Jerome) Ragsdale, a Dallas attorney who died in 1978, was assigned to handle the legal problems involved with her pregnancy by Johnson.” “Mrs. Brown said Ragsdale later claimed to have fathered the child himself. This was to shieldLyndon Baines Johnson from any adverse publicity.” Mrs. Brown stated. Sixteen years after Johnson’s death Steven Brown’s 1987lawsuit is dismissed in 1989. “Mr. Brown filed a $10.5 million suit against Lady Bird Johnson alleging that she conspired todeny him part of the former president's inheritance." “What it was like to bear and raise Johnson's illegitimate son – and to keep his paternity a secret even from the boy. The photograph at left from Madeleine Brown's 1997 book Texas In The Morning appears to be Madeleine's sole "proof" Lyndon Johnson was Steven's father. Over the years as I looked at the timeline I became curious about two things. Why didn’t Madeleine Brown mention Johnson’s paternity in November of 1982? Why did Steven Brown file the lawsuit and then fail to appear in court? Years ago, in 2002, I tried to get court records of the 1987 lawsuit. After several unsuccessful attempts I could do nothing but wait for technology to improve. I thought as time went by I might be able to recover the documents through Internet searches. Several months ago I was able to obtain a court record which shed new light on the whole affair. The reason I could find nothing in 2002 was because in 1979 Steven and Madeleine had filed a different paternity lawsuit in Dallas County only to have it dismissed and moved to Bastrop County. Why Bastrop County? Eight years before Steven filed suit against Lady Bird and three years before Madeleine claimed the affair with LBJ they both were contending Steven’s father was Jerome Ragsdale! This was the same Jerome Ragsdale who Madeleine would later claim wanted to profess paternity “to shield Lyndon Baines Johnson from any adverse publicity.” Ragsdale died on July 17, 1978 at Smithville, Texas. Smithville is located about 240 miles south of Dallas in Bastrop County hence the reason the Bastrop County court system handled the case. "VI. Applicant (Steven Brown) was a party to a suit brought by Madeleine F. Brown claiming a `lost will' which suit was dismissed by the Proponent during trial on the merits in the Probate Court in and for Dallas County, Texas. Applicant believes that Madeleine F. Brown had a son, Steven Mark Brown, who is now asserting that he is the biological child of Jerome T. Ragsdale, Deceased, and Madeleine F. Brown. Attached to the original Application to Declare Heirship was the Application on which Madeleine F. Brown went to trial, reflecting the relationship claimed by Madeleine F. Brown of her son to Jerome T. Ragsdale. Therefore, Applicant moves the Court to determine who are the heirs to JESSE THORN RAGSDALE's Estate." In March of 1979 Steven Mark Brown was in a Dallas County Court using his mother’s claim of a “lost will” and her own assertion that she had Steven as a result of a tryst with Jerome Ragsdale. The suit was dismissed in Dallas County because the estate was being administrated in Bastrop County by Silky Ragsdale Crockett. Undeterred Madeleine and Steven pursued the paternity claim in Bastrop County. In the end neither Madeleine nor Steven provided proof of paternity. What was their next step? It would seem they laid low for three years until November of 1982 when Madeleine announced she had an affair with Johnson. At that time she did not reveal Steven was Johnson’s son. Steven and Madeleine waited until June of 1987 for Steven to step forward once again. Having failed to prove Jerome Ragsdale was his father, as his mother insisted and he believed, he decided to become Lyndon Johnson’s illegitimate son and sue seventy-four year old presidential widow Lady Bird Johnson for 10.5 million for denying him his birthright. In January of 1989 Madeleine “acting through her attorney, filed wills purporting to be those of Guy and Jessie Duncan.” The probate court subsequently discovered the true will was filed by Gary Dalton. The State then prosecuted Madeleine Brown for the offense of forgery. She was sentenced to confinement in the Texas Department of Corrections for 10 years and a fine of $500.00." Possibly because of her advanced age (She was 67 at the time.) the sentence was modified to "a period of 10 years" probation. Now there are some who I assume already know about this particular case. They realize that the case was appealed and they would no doubt claim Madeleine was found not guilty. That is not true. The appellate court merely reversed the decision of the lower court on a technicality. Madeleine had an attorney file the will rather than doing it herself. Based on that fact, the appellate court reversed her conviction. But none of this discounts the reality that Madeleine Brown had Deborah Abbe prepare a forged instrument and then forged Guy Duncan’s name for presentation to the probate court.